Jennifer MacDonald has been with Cammisa + Wipf for 15 years. An early influencer on her path to engineering was her Dad. He loved to tinker, and she enjoyed helping him. That, combined with her talent for math and science, directed her to California Polytechnic State University, San Luis Obispo, where she earned a B.S. in Electrical Engineering. She was one of the few women in the program at the time. Jennifer joined Cammisa + Wipf after graduation. Her experience over the past 15 years has spanned healthcare, laboratory design, K-12 schools and higher education. She is knowledgeable in lighting design, electrical distribution, and low voltage systems, including nurse call and fire alarm. She has been involved with all aspects of the projects, from schematic design to project close out. Recently promoted to Senior Associate, Jennifer’s responsibilities also include project and contract management, project engineering and quality control. 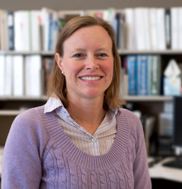 With a zeal for sustainable design, Jennifer has led the electrical engineering effect on several LEED projects, including one of the first LEED Commercial Interior rated projects. She is also knowledgeable about Collaborative for High Performance Schools (CHPS) ratings for K-12 schools. Specializing in many aspects of healthcare, including radiology equipment, operating rooms, patient care areas, and intensive care units, she recently designed a hybrid operating room at UCSF Medical Center. This challenging project combined the traditional operating room with magnetic resonance imaging (MRI) and was designed using BIM. Jennifer is a registered Professional Engineer (PE).